Thu, 26 Jun 2014 at 3:17 p.m.
[Evidence] No-one believes his crap. Slippery Lawrence Yule treated like yesterday’s scrumpled chip paper. █ The Ratepayers’ Report is based on data collated by the Taxpayers’ Union, a lobby group, from councils’ annual reports. It also includes information collected independently from the Department of Internal Affairs and Statistics New Zealand. All of this has been checked and sent to the 67 councils involved for them to review. See local government league tables published by analyst Larry Mitchell since 2010. Dunedin is part of the international Mayors for Peace collective, and is distinguished as a peace city. But more could be done locally to make that commitment more effective, according to the director of the National Centre for Peace and Conflict Studies. And Dunedin City Councillors are among the first to hear about ideas for distinguishing Dunedin as a place of peace. It’s got an Appeasement Mayor. Pay pay pay rather than man up and give the finger to Big Rugby, Fubar-associated grabby hands, and those scabby mongrels who frightened him into paying for telling the truth, O dear ‘scuse my error, I mean DAMAGING their GOOD (ahem) names. Anything to dodge angry birds – vultures. Then after all that assiduous limpness along come the passive peasantry, cheesed off, gullibility falling away like sunburn peel. The peasants are revolting, Daaave! Not like those nice men with soft hands and hard hearts who were your friends, long as you saw things their way. The violence in our community is multi-causal and complex. I’m not sure how promulgating a peace city slogan is going to get that far. Even now, Parliament and council meetings start with a prayer. I don’t think that particularly sets the mood to be non-combative, inclusive and ‘to love one another’. We also don’t have to look far at some prominent, self-declared practising Christians in this city who make you want to puke. You know who they are. They could learn a lot from that genuine person, or family, in the next pew who don’t constantly sing their own praises/stroke their own egos! “City of Peace”, it’s not that different from the recent moniker “Gigatown” and we now hear ‘bugger all’ about that. I have never heard of Lawrence Yule but he is obviously another of those tame sycophants authorities call in to pacify the restless natives. He comes to the inevitable conclusion that generally local bodies debt to asset ratios are prudent. 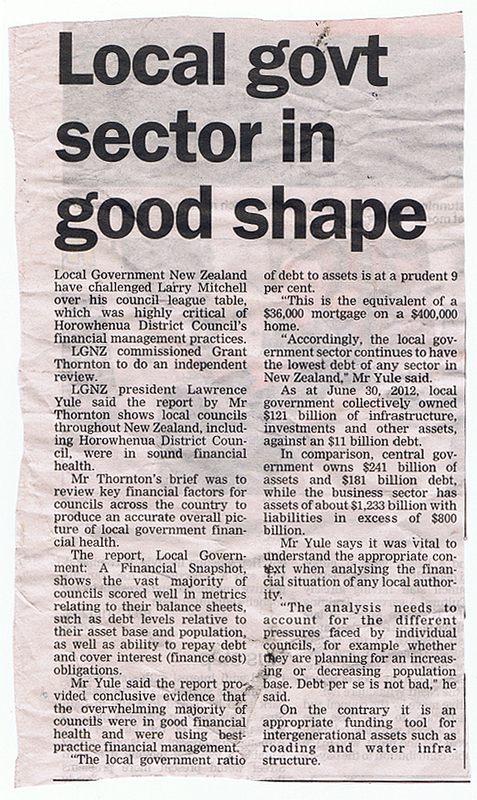 In a recent discussion with Sue Bidrose I said that Dunedin’s debt was very close to being unmanageable. Her response was that Dunedin’s assets of $3,750,198 covered the consolidated debt of $623m at 16.60%. But my problem is that items like the Stadium, Settlers Museum, Dunedin Centre, Chinese Garden etc are in reality not assets but liabilities. None of the mentioned produce revenue anywhere near that required to service their respective debts. Nor do they provide any essential services. And that is the problem. But tell that to Lawrence Yule and he would be very critical. It’s this attitude that disguises the fraught position many ratepayers up and down the country are faced with. Totally agree, Calvin. There was a very good article out of the US which discussed the tangible asset value of specialist property and, in particular, stadia. A stadium is only worth value as a stadium if there exists a market to sell to someone else who wants a stadium in the same location. As that amounts to pretty much no-one, a stadium as a stadium has little value as an asset. You could value it, for example, as a potential shopping mall. The value could then be quite high as there are more people interested in investing in a shopping mall than a stadium. Then it is an asset. First, of course, you have to deduct the cost of converting it into a suitable shopping mall complex. The same applies with the Chinese Garden. It only has an asset value as a garden to someone who wants to buy a garden in that location. As you note, both types of venues in their current forms are in fact liabilities. The Town Hall could, in theory be converted to another purpose quite simply. That makes it more attractive as a potential investment and hence that property is an asset with a tangible value. Where payment for organ transplants is allowed (or nudge-nudge, occurs) kidneys and hearts have high value. I have 2 of the former and one of the latter. By the Yule method of asset calculation, does this make me wealthy or merely non-dead? In certain circles it makes you very popular. Lawrence Yule according to his own description, is a conservative farmer that has got into Local Government and is now the Mayor of Hastings and is also the head of Local Government NZ. His views stem from this background. Anyone that believes that all Local Councils are in excellent shape is a fool, but this view is one that has become endemic throughout those bodies set up to monitor the performance of Local Bodies. It only takes a cursory glance to look at the recently published league tables which came from Larry Mitchell’s original work and later picked up by Fairfax to show the stupidity of this Yule character. Kaipara? Dunedin? Auckland? Kaipara governance slated and replaced by a Commissioner and retrospective legislation to protect the guilty from the ratepayers. Dunedin with massive debt, appalling governance, rate increases on a low socio-economic running at twice inflation. Auckland with a Mayor widely ridiculed as Pants Down Brown with out of control spending and even larger debt load per ratepayer than Dunedin. And then we have the regulatory bodies such as Audit NZ and the OAG. So busy on hiding their ineptitudes that they can’t see the bleeding obvious. What I see when I take a cold hard look around NZ is an increasing rate of willingness to accept or trivialise fraud, a tiredness for public body accountability brought about by thoughts that it can’t be fixed, and increasing desires by politicians to pursue philosophical beliefs that often are unproven and driven by external forces. Russell, you ain’t wrong: “an increasing rate of willingness to accept or trivialise fraud, a tiredness for public body accountability”. The personal growth industry’s slogans about not being emotionally hog-tied by old hurts, not lacking validity in the appropriate setting, are trotted out where totally unsuitable. “Move on” and “don’t relitigate the past” are now injunctions to turn blind eyes toward those responsible for the wellbeing of the community who have been irresponsible or worse. With them powerful adults take useful advice from one context and self-servingly enjoin us to let incompetence and malfeasance thrive unhindered. Hype; wealthy? I don’t know. Undead? Mmmmm? I’ll have to think about that. Being asset ‘rich’ cash poor is hardly an enviable position to be in. Especially when the assets like the stadium have a phoney book value to justify more debt spending. You have all got it wrong. It is not peace city that they want, it is the best piece of the city that they want when the debt accumulated by Cull and Co cannot be met. Whippet, that’s it. How to play Monopoly. Link received Fri, 11 Jul 2014 at 6:13 p.m. Regular readers will know I loathe socialism and socialists with a passion. The worst example of socialism being promoted at the moment is the Ruataniwha Water Storage Project in Hawkes Bay, where the socialists at the Regional Council want to spend about $275m of taxpayers’ money to give water to 150 farmers, at the same time as turning the Tukituki River toxic. This project has always looked like a big socialist scam, and it seems that even if 500 people in Central Hawkes Bay parade around supporting bludging off the rest of us, their council doesn’t want to invest their money in the dam. A Kapiti councillor is taking his own council to the High Court over his exclusion from the chief executive’s performance and pay review process. K Gurunathan is seeking a judicial review, saying he was unlawfully excluded from meetings of the chief executive review committee, and denied access to documents affecting the council’s assessment of chief executive Pat Dougherty. Last month the council announced that Dougherty had received a 2.09 per cent pay rise, taking his annual remuneration to $300,430. It followed a $44,000 rise three years ago. In his court affidavit, Gurunathan says the entire council was on the chief executive performance and employment committee in 2010 but, after a public outcry over the $44,000 pay rise, a smaller review committee was established and every councillor had to sign a declaration of confidentiality. This January, Gurunathan, along with two other councillors not on the committee, was asked to leave a meeting discussing the latest rise. His affidavit says: “There is no avoiding the fact that in recent times the council has been responsible for some projects which have gone badly wrong, wasted public money and angered large sections of the community.